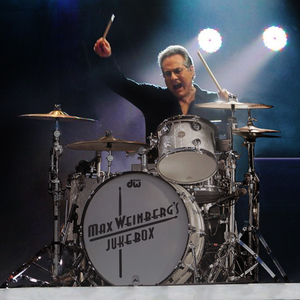 VIP Tickets to Max Weinberg’s Jukebox – Available Now! Max Weinberg has had one of the most prolific careers any drummer could dream of. Having served as the longtime drummer for Bruce Springsteen’s E Street Band, and the bandleader for Conan O’Brien on Late Night and The Tonight Show, Weinberg has solidified his place as a drumming virtuoso. In 2014, Weinberg was inducted into the Rock N’ Roll Hall of Fame in 2014 as a member of the E Street Band. On April 25th, 2019, Max Weinberg’s Jukebox comes to Hopewell Theater. This isn’t your average rock and roll show though, it’s a truly interactive experience: Weinberg invites the audience to create the set list, in real time, while he and his crack four piece group will play that night. Performing songs from the glory days of rock and roll, guests will get to choose from a video menu of over 200 songs — everything from the Beatles to the Stones to Bruce and The E Street Band’s biggest hits! And yes, you heard correctly, the crowd gets to yell out their choices and Max plays them! Add on the special VIP Ticket package which includes a Meet and Greet, a post-performance photo-op with Mr. Weinberg, and one (1) personalized autograph. Tickets are available here. Upgrade your ticket to VIP Package at checkout or call our box office at 609-466-1964. This is a one of a kind performance that you definitely do not want to miss!